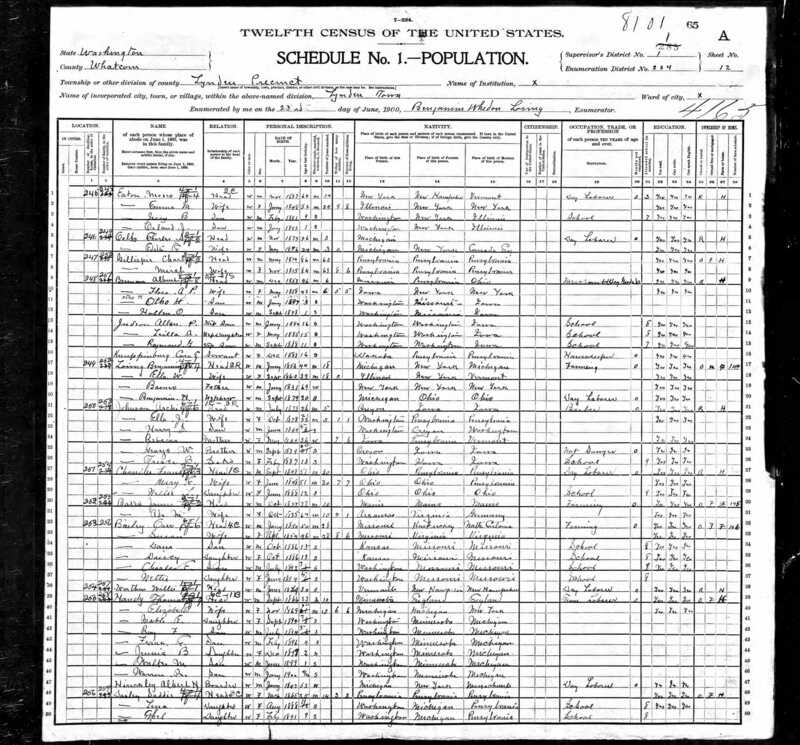 As mentioned previously, Ada U Wicksall was born in 1858 or 1859 in Missouri as documented in the 1860 United States Federal Census. 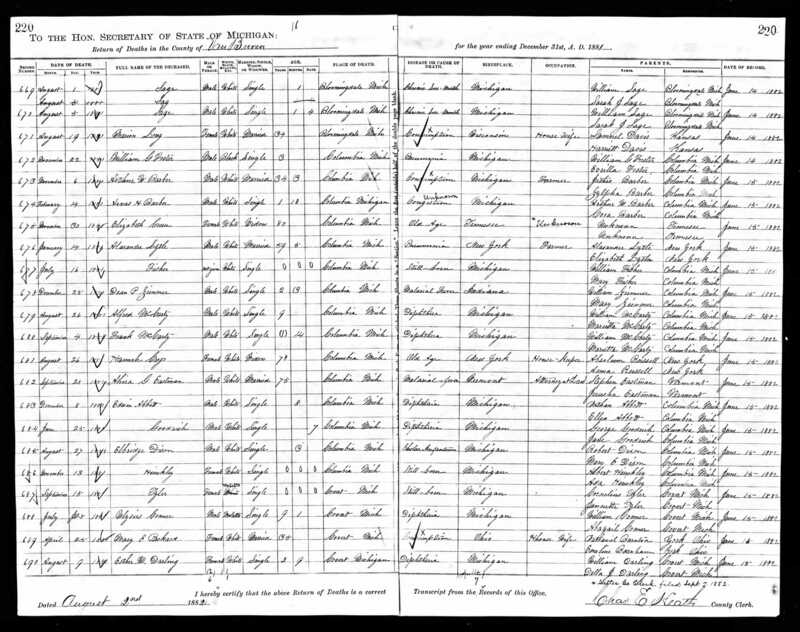 In 1870 Ada is listed with the family on the 1870 United States Federal Census in Paw Paw Michigan. 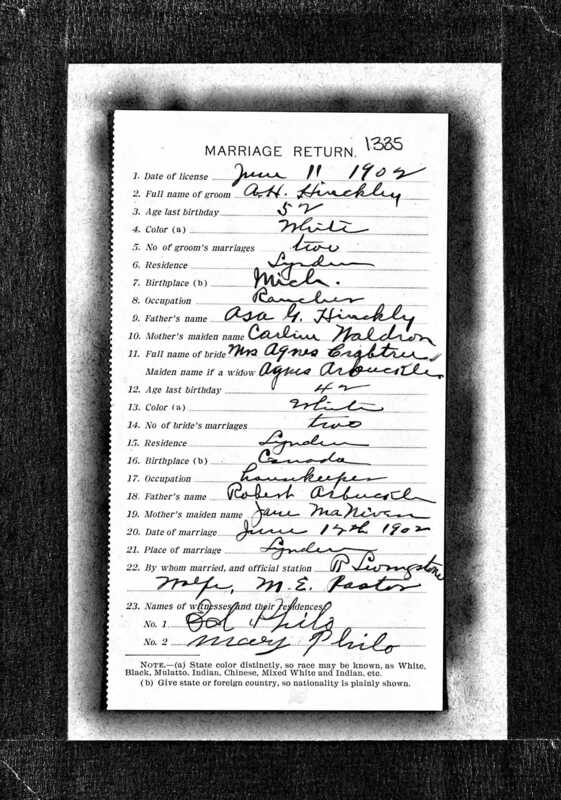 On October 3rd 1878 Ada U Wicksall at the age of 20 marries Albert Harrison Hinckley aged 31 in Pine Grove Michigan with Will Wicksall and Rebbeca Perrin as witnesses. Albert is the son of Asa and Caroline Hinckley of Paw Paw. This was his second marriage. His first was to Sabrina (Bina) Orr which ended on March 13th 1875 when Bina died in childbirth. 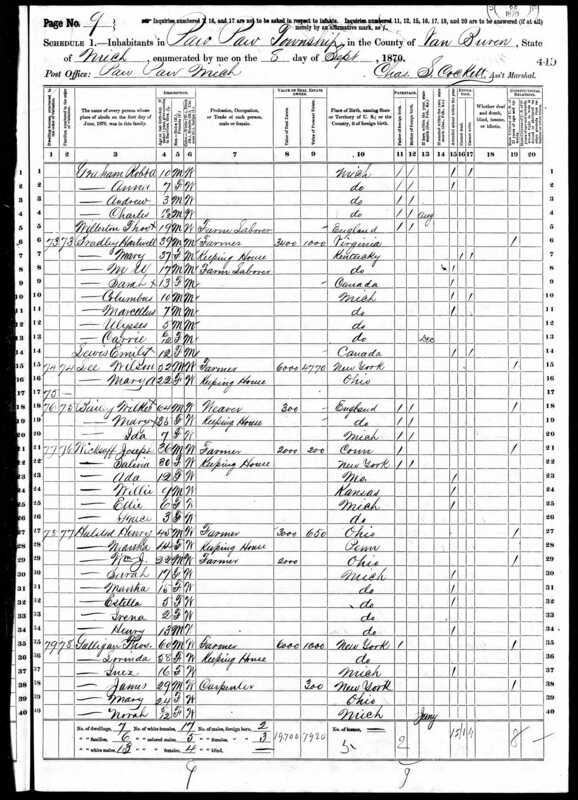 The 1880 United States Federal Census shows Ada and Albert Hinckley are living in Columbia Township, Van Buren County Michigan. Ada is "keeping house" and Albert is listed as a farmer. Ada's sister Grace is also there as a boarder. On February 24th 1881 Vietta Wicksall married Andrew J Becker in Columbia Michigan with Albert Hinckley and William Wicksall as witnesses. Later that year on November 13th, Ada and Albert have a still-born child. For a long time this is where the story ended for Ada. I had been able to find Albert living in Washington state but no sign of Ada until a trip to Breedsville Michigan in May 2018. Will, Ada, Grace, Guy and Joseph Wicksall had all lived in the Breedsville/Bangor area in the 1880's so I hoped I might find something. There in the Breedsville Cemetery are two headstones that helped me fill in some of the gaps. Away from most of the Hinckley headstones I found two graves for Ada and Ivy Hinckley. It turns out Ada and Albert had a second child named Ivy G. Hinckley born in 1884. Based on Ada's obituary it looks like Ada, Ivy and Albert Hinckley moved north to Jacobsville Michigan some time around 1888. They were joined there by Joseph and Guy after Guy graduated from Bangor High School in 1890. While living in Jacobsville it appears the Hinckleys would travel back to the Paw Paw area to visit family. The second headstone was Ada's and lists her name as Ada E Hinckley. I had always assumed her middle initial was 'U' based on her marriage records but the 'E' on her headstone is probably more likely. None of the other records I have for Ada lists a middle initial. On April 2nd 1892 Ivy dies at her home in Jacobsville at the age of 7 years and 8 months. A short mention and a full obituary show up on the same page in the L'Anse sentinel on April 09, 1892 under the name Ida Hinckley. The text of the short mention is as follows: "School was closed Monday in order to give the pupils an opportunity to pay their last tribute in the memory of their deceased school mate, Ida Hinckley, whose funeral occurred on that day." The text of her obituary is as follows: "In Memoriam - Died, on Saturday April 2, 1892, of spinal meningitis, Ida. The only child of Mr. and Mrs. A. H. Hinckley, aged seven years and eight months. Funeral services were held ath the school house on Monday morning by Rev. Mr. Brunard. The services were attended by the teachers and pupils of the school in a body and a numerous throng of sympathizing friends. The remains were taken to Bangor, Mich., for internment. The deceased had been attending school as usual until Friday. Friday night at about 11 o'clock she was taken ill and dies within twenty-four hours. She was the idol of her parents; her life was the flower of their love-they regret not is blooming though its failing gives them pain." "But I know that some glad day, She will greet us far away, God will keep her sweet and fair, So we have her in his care" "Fare-the-well sweet bud of beauty, Ida, darling, fare-the-well: For thou were too pure and lovely, In a world like this to dwell." In the April 6th 1892 edition of the True Northerner there is a short paragraph on Ivy's death. The text is as follows: "A telegram received by E. H, Hinckley on Monday morning announced the sudden death of his cousin, Ivy Hinckley, at her home in Jacobsville, Mich. Not more than six weeks ago, Miss Ivy, a rosy, healthy girl, was a visitor here and the news of her death was very unexpected." 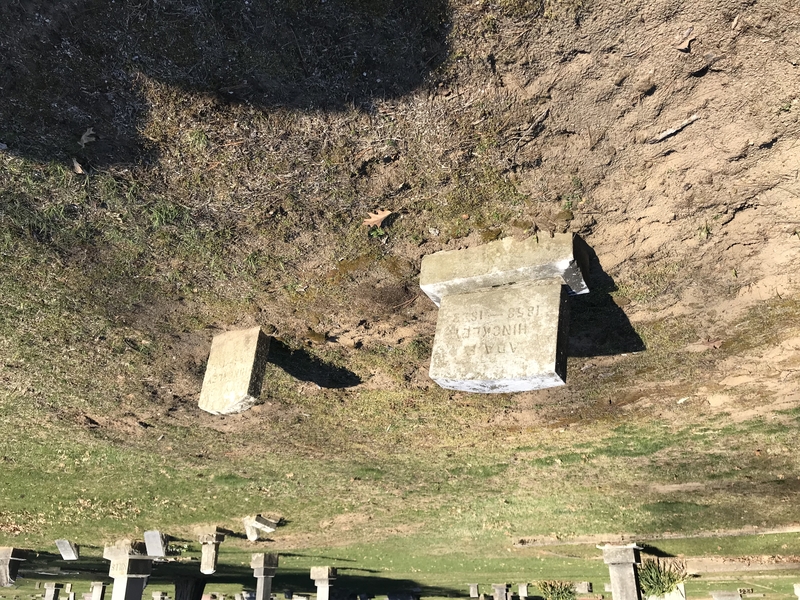 In the April 23, 1892 edition of the L'Anse Sentinel is says "Mr. A. H. Hinckley returned Thursday from Bangor where he had been to bury his daughter Ivy." On November 28 1893 Ada dies at the age of 35. Her obituary is in the December 02, 1893 edition of The L'Anse Sentinel and the text is as follows: "Died, on Tuesday, Nov. 28, 1893, at her home in Jacobsville, Mrs. A. H. Hinckley, aged 37 years. Although Mrs. Hinckley had been in poor health for some time she did not take to her bed until a week before her decease. The immediate cause of death was cerebro spinal Meningitis. The deceased had resided in Jacobsville about five years and was considered a woman of strong social qualities and one who possessed the friednship of all who know her in a marked degree. She leaves a husband, two sisters, two brothers and an aged father to mourn her loss, to whom the sympathy of the entire community is extended in the hour of their deep affliction." "Funeral services were conducted at the home Wednesday morning by the Rev. G. I. Ge?nell Congregational minister, of which church the deceased was a faithful member. The remains were taken to Bangor Mich., for burial by her little daughter who preceded her to the other shore eighteen months ago." On page 5 of the December 8, 1893 edition of the Bangor Advance under the "Breedsville Items" section, Will Wicksall is mentioned along with an obituary for Ida. "Will Wicksall and family came from Field to attend the funeral of Mrs. Albert Hinckley and visited with Breedsville friends last Monday and Tuesday, returning home Wednesday." "The remains of Mrs. Albert Hinkley of St. Ignace who died of spinal meningitis, was brought to this place from Bangor last Friday. The funeral services were conducted from the M. E. church by Eld. Reese of Bangor and the remains were laid to rest beside a daughter who died about 18 months ago. The friends have the sympathy of their many friends as they were formerly residents of this place." 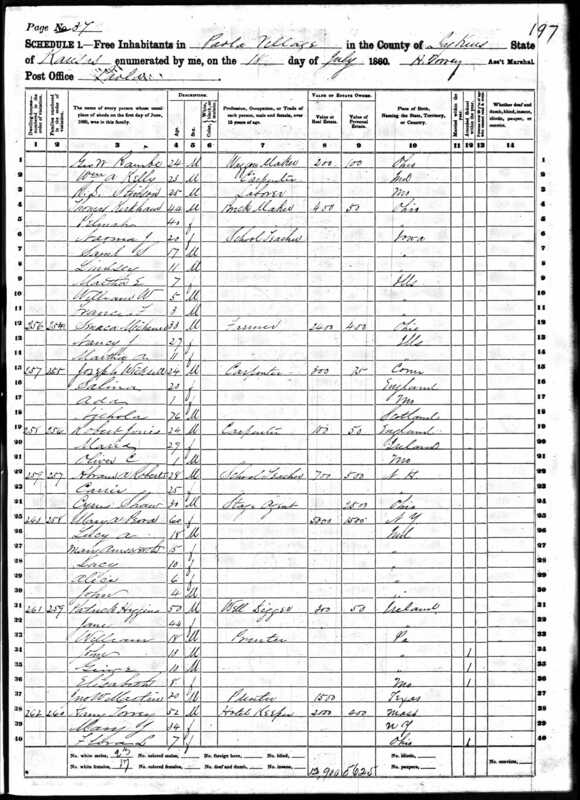 On the 1900 United States Federal Census Albert N(H) Hinckley is in Lynden, Whatcom, Washington. He is listed as a widowed boarder with an occupation of "day laborer". His age is correct and he is listed as being born in Michigan. In June 1902 Albert gets remarried to Agnes Crabtree in Lynden, Whatcom, Washington. 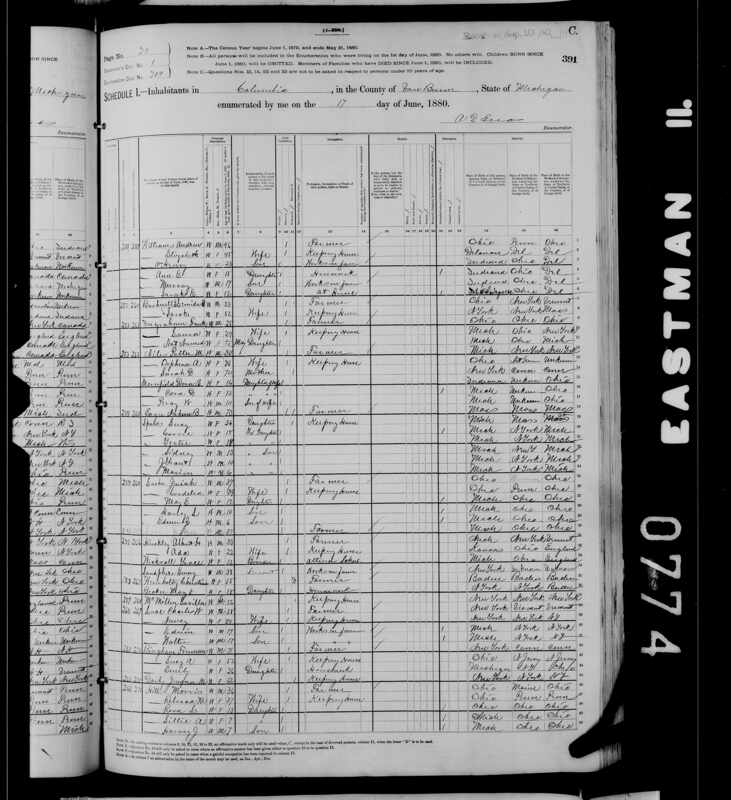 FamilySearch has a source "Washington Death Certificates, 1907-1960" which lists the death of Albert H Hinkley on January 22nd 1912 in Lynden, Whatcom, Washington. His birth is listed as about 1849 and his father is Asa Hinkley. His Headstone can be found on Find a Grave.